ASTM A182 Stainless Steel Socket weld Full Coupling, Nickel Alloy Forged Socket weld Full Coupling Supplier, Duplex Steel Forged Socket Weld Full Coupling Exporter. SS ASME B16.11/BS3799 Forged Socket weld Full Coupling, Carbon Steel Socket weld Full Coupling Stockiest, Alloy Steel Socket Weld Full Coupling Fittings Manufacturer. Many leading manufacturers, supplier, and exporter of the Forged socket weld full coupling are available in the online market. They are designing these couplings in order to match various types of applications perfectly. 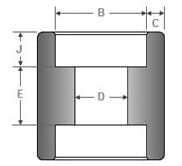 The ranges of couplings are made available to various industrialists in different specifications, dimensions, class, size, types etc to suit all applications requirements. It is also offered to the buyers at competitive rates with value-added services. To bring out the excellent quality of the product the production is done under the strict guidance of the team of experts. The experts are holding a good knowledge of how the superior quality of Forged socket weld full coupling is developed. The quality control team is present in the production unit with full efforts and considering product quality standards are maintaining every single produced coupling quality. The product is created with the proper use of refine the technology and modern equipment to add superiority in couplings. The fabrication of welded couplings is done by using the superior quality of alloy and by considering product quality standards and industrial setup production norms. There are few good qualities that the product is having due to which it has become globally popular and high in demand. Good dimensional accuracy, fine surface finishes, rugged construction, toughness, durability. It is greatly resistant to stress corrosion cracking, crevice corrosion, pitting, and oxidation and withstand high heat. The testing of the Forged socket weld full coupling is also done by assuring that no poor quality of the product is shipped to the buyers. Positive material identification test, pitting resistance test, intergranular corrosion test, hardness test, flattening test, flaring test, macro test, micro test, mechanical test, chemical test is conducted. The documents like quality assurance plan, raw material test report, material traceability report, packaging list, guarantee letter, lab test report are provided to the buyers. The test certifications including mill test certification are provided to the buyer as per EN 10204/3.1B, third-party test report, radiography test report is offered. The packaging during the time of Forged socket weld full coupling dispatching is done carefully. The waterproof packaging and wooden cases/pallets packaging is done. We are one of the leading Manufacturer, Exporter and Supplier of Socket Weld Full Coupling. These couplings are designed to match different types of loads perfectly, under the expert supervision of our team of experts. Forged Pipe Fittings and Forged Socket Weld Fittings Covers the Pressure, Tolerances, Dimensions, Temperature Ratings, Marking and Material Requirements for Forged Socket Weld Fittings Used in High-pressure Applications. Our range of Socket Weld Full couplings are available in different grades of steels at the most competitive prices.